What's it about? Vain, but likeable silent movie star Georges Valentin (Jean Dujardin) finds his career on the slide when the invention of 'talkies' leaves him outdated. This contrasts with the rising star of Peppy Miller (Bérénice Bejo), whose movie career was inadvertently kick-started by Valentin. How will their paths cross again? Is it any good? Yes, it is, although it didn't leave me totally dumbstruck. (That's a funny joke because it's a silent film, see? Well, it's a joke, at least.) Yes, this does have the distinction of being an almost entirely silent movie, filmed in the style of silent movies from the early days of Hollywood. However, it's probably not so much a homage to silent movie film-making, as to the art of economical story-telling. Notably, Hazanavicius cites John Ford, Alfred Hitchcock and Billy Wilder as his inspirations, not silent movie directors, and there is a pleasing unfussiness to the way he tells, or make that shows, his tale. Plot-wise, it's uncomplicated stuff, borrowing ingredients from well-known classic crowd-pleasers such as A Star is Born, Singin' in the Rain and Sunset Blvd and mixing them into a light confection. Then it adds a few nice flourishes of its own to add a little class, such as a couple of amusing jokes with the intertitles ("I won't talk..."), a really striking dream sequence in which we hear all sounds except Valentin's voice, and one or two good old-fashioned dance sequences, all of which means it's easily digested. Dujardin, who won the 2012 Best Actor Oscar is good, but it's Bejo really who lights up the screen, all big eyes and long legs. Well, not all big eyes and long legs - that would be just monstrous looking and not very credible, but you know what I mean. All in all, it's a playful and charming romantic comedy and if it encourages people to check out a few old classic silent movies, then that can only be a good thing. 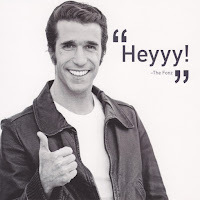 What does the Fonz think? " "